Current and back issues of the Diversity League Table can now be viewed online. Please click on the links below to access a digital edition. BSN are pleased to present the full 2017 Digital edition: click here to read. 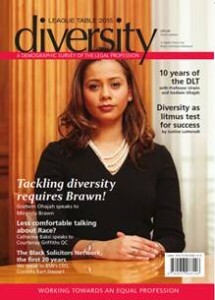 This 10th edition looks at diversity across some of the UK’s leading law firms and chambers. Analysis: by Professor Peter Urwin. Foreword by the UK Prime Minister, the Rt. Hon. David Cameron MP. It’s the BSN’s 20th anniversary year and we interview founding member and CEO, Cordella Bart-Stewart. We also look at 10 years of the DLT. Other interviewees include Courtenay Griffiths QC, UK Diversity Legal Award winners (2014) Jaya Handa and Tunde Okewale. Cover interview with Miranda Brawn. Digital edition: click here to read.